This was expressed when the board and management team of the company paid a courtesy visit on him in Warri, Delta State. 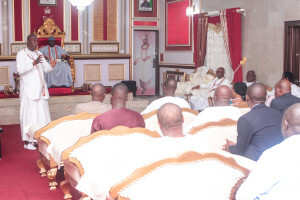 According to the Olu of Warri, he was delighted at the concession of the terminal because that has been his desire since ascending the throne, adding that he has been mounting pressure on relevant government agencies and senior officials to do something urgently about the hitherto abandoned terminal. 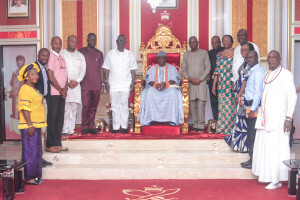 He tasked the management of Ocean and Cargo Terminal Services Limited to bring their ingenuity and business acumen to bear so that the terminal becomes economically viable and a source of blessing to the Warri kingdom. He also promised to lend fatherly assistance at all times to the concessionaire towards the success of its operations. “I am very delighted with the coming of the company to Warri. It has always been my wish that the port is fully utilized. Warri is now ready for business and economic growth. The relative peace that the town had enjoyed in the last few years is a pointer to the readiness of all stakeholders to move Warri towards economic development and social integration. I want to urge the company to take advantage of the conducive environment to positively affect the host communities especially in the area of job creation”, he said. Earlier, Dr. Taiwo Afolabi, Chairman of Ocean and Cargo Terminal Services Limited, had solicited the cooperation and support of the monarch and the people, adding that the company was interested in collaborating with all relevant stakeholders in the industry and host community for the benefit of all concerned.